Breaking two cardinal rules in my kitchen—versatility and real-world functionality—my favorite new toy is silly, beautiful, and fun. 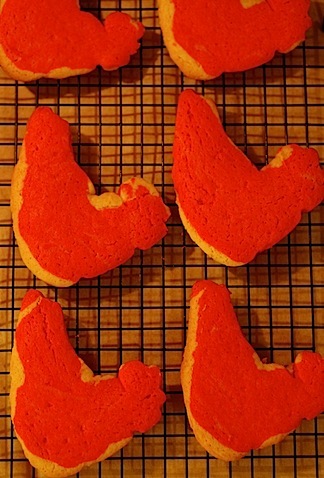 It can only do one thing: make cookies in the shape of an obscure cut of lamb. 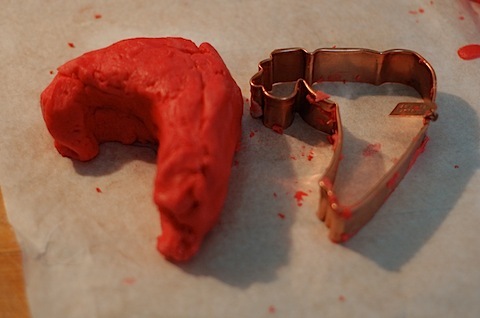 A while back, while checking out the display cases at the excellent little butcher shop, Avendano’s, my friends spotted a batch of hand-crafted, limited-edition, copper cookie cutters. For some reason, they thought of me. The packaging was gorgeous. 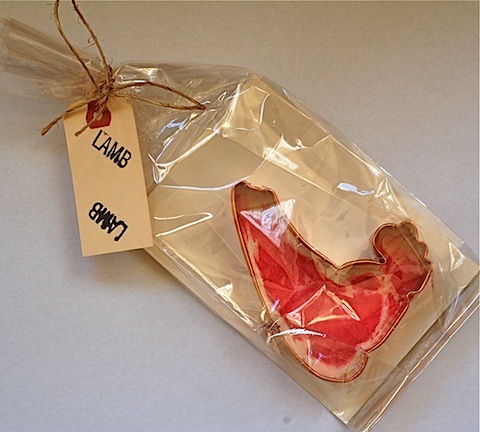 Each form is hand-stitched to a card painted with a watercolor depiction of the actual cut of meat. I am now blessed with a â€œMiddle Cut Ribâ€ of lamb, which, to be honest, does not resemble any overly trimmed product that I’ve seen at most meat counters. My favorite part is the tiny tag, hanging off the cookie cutter like some exclusive designer label and engraved—by hand, of course—with the maker’s phone number. This past weekend, I finally had a chance to give it a try. Since royal icing is one of my least favorite foods, depicting meat with only cookie dough became the challenge. An old recipe (adapted from Vanilla Refrigerator Cookies in the 1976 edition of the Joy of Cooking), a bit of red food coloring leftover from making velvet cake came to rescue. I debated incorporating demi-glace or bouillon for meaty flavor, but decided to stay simple for the test run. Next time. 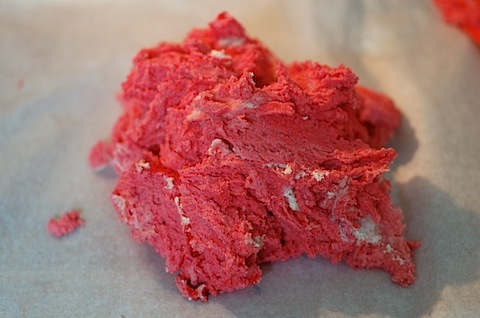 The red-colored dough, with a bits of white dough aka fat marbling left from the mixing. The color will lighten with baking, so make it darker than the final shade you want. â€¦with some reserved, uncolored dough, build up a thin (or thick—your preference) layer of â€œfatâ€ around the lamb loin. I started off with an offset spatula, and then figured out it’s much easier just to flatten pieces of white dough between my palms and press then right into the red dough. Press down firmly on the dough to avoid air pockets, which will later become cracks and gaps. Any breaks later are easy to fix, though, with extra dough. After chilling for a few hours, I sliced the loin thinly with a chef’s knife and transferred the cookies to a parchment lined sheet pan. Final shaping with the cutter happens right on the pan. (The two front cookies have been cut). Sweet meat trimmings. I mushed them together into a log, chilled again, and then sliced into pretty, round, marbled cookies. Be sure to cool the cookies completely on a wire rack before storing them in an airtight container. Layered between parchment, the cookies traveled very well to a weekend picnic in the park. 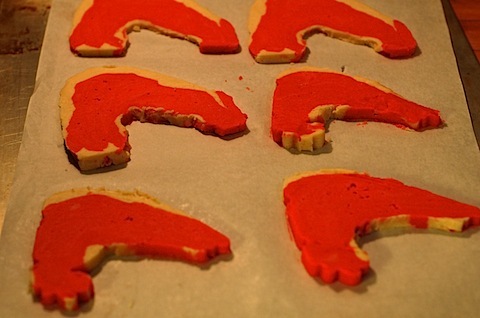 If there’s a meat-lover in your life who happens to like baking or who deserves a batch of meat cookiesâ€¦well, I think there’s a gift out there waiting to be made. Makes 12 large cookies, plus trimmings. Beat butter until creamy. Add sugar gradually and beat until pale and fluffy. In a separate small bowl, lightly beat together the eggs, vanilla, lemon, and almond. Drizzle into the butter-sugar mixture and beat until smooth. Sift together the flour, salt, and baking powder. Stir into the butter mixture. Remove 1/4 of the dough to a separate bowl. 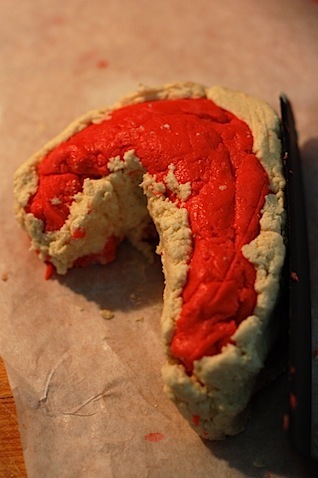 Adding gradually, blend the red food coloring into the remaining dough. 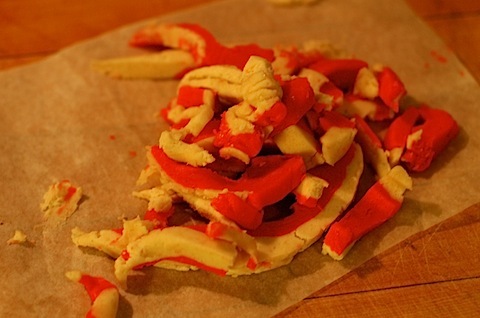 Leave the coloring slightly streaking, to keep the cookies tender and to mimic marbled meat. Shape into logs or lamb loins. Chill thoroughly, or at least four hours. Preheat oven to 400 degrees F. Working quickly, cut into 1/4-inch thick slices. Re-chill dough, if needed, to keep it firm. Arrange on parchment paper and bake just until lightly golden around edges, or 8-10 minutes. Transfer to a rack and let cool completely.